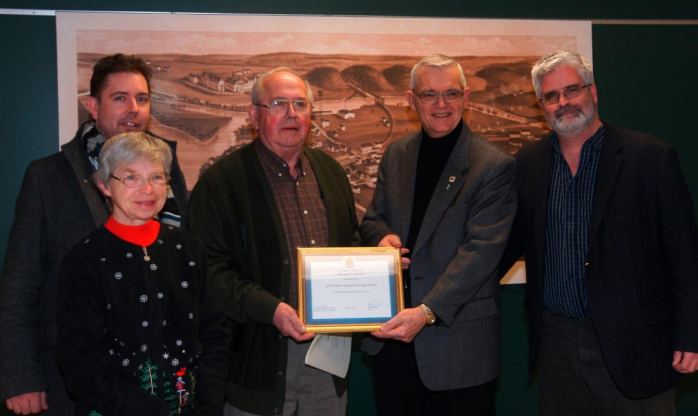 The Quebec Anglophone Heritage Network was honoured by the City of Sherbrooke (Lennoxville Borough) with an Outstanding Achievement Award in the Education category. The award was presented at a special ceremony on February 18 by Borough President the Honourable David Price. In his introduction, David Price highlighted QAHN's long association with Lennoxville, and its various educational initiatives, including its annual heritage essay and photo contests for elementary and high school students, its university internships, its conferences, and, of course, its quarterly publication Quebec Heritage News, distributed all across Canada but produced right here in Lennoxville. On hand for the awards ceremony were QAHN 2nd vice president Grant Myers, bookkeeper Marion Greenlay, treasurer Richard Evans, and executive director Matthew Farfan who accepted the award on QAHN's behalf.